Our heroes have no idea what the treasure might be, and finally arrive at a dusty desert valley to find a boarded-over wellhead. After a spectacular and improbable three-way shootout leaves all of them punctured with dozens of bullet holes but somehow only one of them dead, the well suddenly comes to life, spewing forth a gusher of oil. Disgusted, the two survivors stagger off and as the credits roll they resume their chase across Manchuria. It’s a really fun film, with homage to The Good, The Bad and The Ugly and wire-fu movies plus some touches of Mad Max and Joss Whedon’s Firefly series (down to the whorehouse on the edge of forever and the Chinese-language cursing). But it raises the question (well, at least to me it does): Was the colonel right? Could the treasure have saved the Japanese Empire? Japan entered the Second World War in large part due to its need for oil. The Empire actually used relatively little oil – about 32 million barrels in 1941 (for the whole year, and a good part of that went into Japan’s strategic reserve) compared to 4.8 million barrels per day in 2012, down from Japan’s peak of 5.71 million barrels a day in 1997. The Empire produced almost none of this, relying on imports, chiefly from the United States. Japan went to war against the Western powers in large part to secure the rich oil fields of the Dutch East Indies, which produced about 55 million barrels a year. The United States embargoed exports of oil and gasoline to Japan in August 1941, following the Japanese occupation of French Indo-China, itself a reaction to American aid to the Chinese. Negotiations with the Americans to restore the flow of oil in exchange for a withdrawal from China came to nothing, as did negotiations with the Dutch to replace American oil. If the Japanese wanted oil, they would have to fight for it. All along, they were sitting on top of more oil than they could possibly have used at the time. The mysterious Manchurian oilfield uncovered by the Good, Bad and Weird actually exists: Daqing Field, discovered by legendary Chinese geologist Li Siguang (left) in 1959, is now China’s largest field and the fourth-largest in the world. Another legend of the Chinese oil industry, wildcatter “Iron Man Wang” Jinxi, opened the field in 1960. For decades most of the field’s rich petroleum was allowed to simply spill onto the ground; it produced so much that massive waste was considered an acceptable loss. 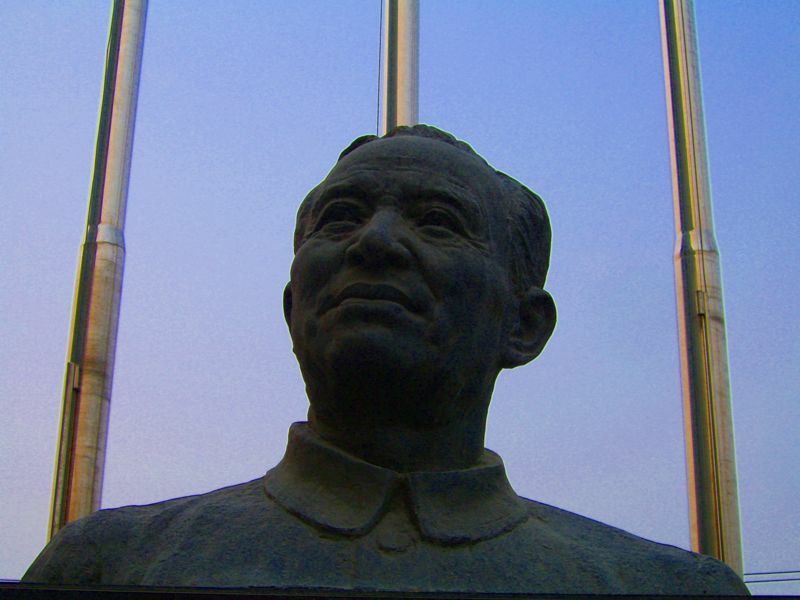 Under the rule of Chairman Mao Zedong, Daqing became a symbol of what China could accomplish on its own with Li Siguang and Iron Man Wang feted as heroes of the new age. Here was one of the greatest oil fields on Earth: discovered by a Chinese Communist, opened by a Chinese Communist, and worked by Chinese Communists. No capitalists had even known the field existed, and Soviet assistance played no part in its development. Across China, posters and pamphlets urged workers and peasants to model their efforts on those of the heroic Daqing oil workers. Daqing currently produces about one million barrels a day. During the 1930’s, teams of Japanese geologists had scoured Manchuria in search of oil and other vital minerals. They found vast treasures of iron ore, high-quality coal, oil-bearing shale and other useful industrial resources. But they failed to locate the Daqing Field. Daqing's Heroes of Socialist Labor. What if they’d found Daqing (or the treasure map spirited away by The Weird)? With Manchuria supplying eleven times as much oil as Japan previously required, the effects on the Empire’s economy and military as well as its foreign policy would be profound. Could Japanese discipline ward off the effects of what economists call Dutch Disease – the often-observed decline in manufacturing and/or agriculture that follows a boom in natural resource extraction, usually oil or natural gas? Japanese heavy industry – the backbone of a nation’s military output – showed strong growth from 1929 to 1937, and then began to increase very rapidly as German investment and licensing agreements took hold. The Japanese labor force paid the price for this, taking home pitiful wages in exchange for long hours – an average of 56 hours per week for industrial workers even before the war (compared to 35 hours per week for the average American factory hand). Assuming that Japan could continue her industrial growth, the availability of cheap and abundant oil would completely change the Empire’s capabilities. The vast efforts poured into synthetic fuel development could be channeled into other sectors. Motor vehicles, rare in Japan, would become commonplace. The Imperial Army would become a mechanized force, the Army Air Service and Navy could train far more pilots, and the Navy could grow as well. The Daqing Field lies in Heilongjiang Province in north-central Manchuria (hex 1208 on the Great Pacific War map), conveniently close to the Chinese Eastern Railway. That would ease the transport of workers and materials to exploit the field (as it did in the early 1960’s) and to lay a pipeline to the refineries then under construction near the coast of the Yellow Sea to handle the output of southern Manchuria’s shale-oil beds. Those refineries would require expansion, but the Japanese already had oil infrastructure projects under way that could be expanded rather than having to start from scratch. With a secure supply of petroleum, would Japan have gone to war with the Western powers? The need to seize the oil fields of the East Indies would no longer exist. Replacing that would be the need to protect the Manchurian oil field from the Soviet Union. Even if the Soviets did not have designs on Manchuria, they would have to respond to an even greater Japanese build-up there, making war far more likely. A major oil find in Manchuria would definitely strengthen the “Strike North” faction. Similarly, does the possession of massive oil reserves take away the Japanese incentive to attack China in 1937? Probably not; if anything, the ability to field large mechanized forces would have made the Japanese more confident of victory and thus more likely to invade China. Giving the Imperial Army plentiful tanks and personnel carriers and trucks – and two large foes to turn them against – would also upset the delicate political balance between the Army and Navy factions at the imperial court. How this changes the balance of power in East Asia depends on when the discovery is made. If the oil is uncovered in the early 1930’s, soon after the 1932 Japanese takeover of Manchuria, then the Japan of 1941 is a formidable opponent well able to fight the United States on even terms – at least until the much greater weight of American industry and population can make itself felt. In terms of Great Pacific War, access to the Daqing Field makes great changes to the Japanese position and force pool. There’s less chance of war with the United States (though still a pretty good chance – Japan’s aggression in China and alliance with Germany would remain as points of conflict) and a greater chance of war with the Soviet Union. The Kwangtung Army garrisoning Manchuria would have more armored units, and its infantry would be motorized. The Imperial Navy would likely have completed its gigantic Yamato-class battleships a little faster, though it’s doubtful that these huge ships would have done them much good. The Japanese already had built to the limits of the Washington and London naval treaties, and only after these limits expired in 1936 could their new-found wealth have an impact. The Shokaku class of aircraft carriers might, for example, have numbered four ships rather than two but there would be no huge increase in naval construction. With the supply of fuel limited only by refinery capacity, the real impact on the Imperial Navy would be in its air service. Many more planes and especially trained pilots would be available, greatly enhancing Japanese striking power. What the discovery of Manchurian oil would not have done is bring Japan to military parity with the United States. While the shortages of oil no doubt crippled Japanese capabilities, particularly in pilot training, the real shortfall was in industrial capacity and that could not be mended in just a few years. That comparison of weekly hours worked up above is one of the key disparities: Japan was already working at full blast well before the war broke out. The Americans had plenty of slack. Invade Manchuria yourself in Great Pacific War!